The Venus flytrap is perhaps the best known of carnivorous plants — those that get essential nutrients from trapping and consuming insects, particularly when they can’t get enough from the soil. 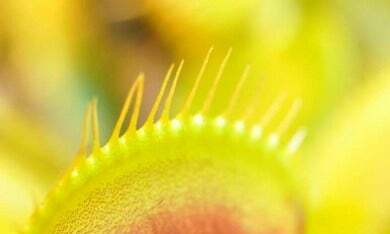 Now a team of German scientists has discovered that the flytrap can actually count, and this ability is the key to knowing the difference between the presence of prey and a false alarm. The Venus flytrap has a pleasing fruity scent, the better to attract unsuspecting insects to its deceptively welcoming leaves. Those leaves are lined with ultra-sensitive trigger hairs that sense when something touches them. When the pressure is sufficient to bend those hairs, the leaves snap shut, trapping the prey inside with the aid of long cilia that act like fingers, grabbing and holding the insect in place. Then the plant secretes digestive juices, which turn the insides of said insect to mush over the next five to twelve days. Once all the gooey tasty bits have been absorbed, the trap reopens and the dry husk of the insect blows away in the wind. Here’s the thing: the trap doesn’t close all the way in the first few seconds. Smaller insects can escape, and if the plant happens to trap a small nut or stone by mistake, the trap will re-open to release it within 12 hours. Try to feed your Venus flytrap a dead insect, and it won’t close all at all, unless you mimic the movements of live prey. Exactly how the flytrap knows the difference between actual prey and non-digestible objects has been something of a mystery. In a new paper in Current Biology, researchers at University of Wurzburg in Germany conclude that the Venus flytrap manages this feat by counting the number of times something touches its hair-lined leaves. The scientists mimicked the motions of insects landing on a flytrap by zapping the leaves with mechano-electric pulses (“action potentials”) of varying intensity, and then measuring the plants’ responses. They found that the first touch serves to trigger a “ready” mode — the plants note the stimulus, but hold off on snapping shut. The second touch causes the trap to close around its prey. It doesn’t immediately close all the way, however. If the trapped object is an actual insect, it will struggle and set off those ultra sensitive hairs again. This is when the Venus flytrap oozes a special hormone related to the sensation of touch. Finally, when there have been five triggering stimuli, the digestive enzymes appear, kicking off what co-author Rainer Hedrich has called “a deadly spiral of capture and disintegration”. In short, the plants are performing a basic cost-to-benefit analysis. “The number of action potentials informs [the plant] about the size and nutrient content of the struggling prey,” Hedrich said in a press release. “This allows the Venus flytrap to balance the cost and benefit of hunting.” The next step is to sequence the plant’s genome in hopes of uncovering further clues about traits specific to the flytrap’s penchant for meaty insects. Images: (top) Audrey II from The Little Shop of Horrors (1986). (bottom) Close-up of a Venus flytrap. Credit: Sonke Scherzer.